The Queen guitarist on the night he booked Hendrix to play a gig at his university in 1967. 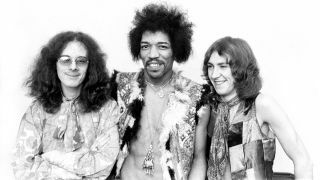 I was on the Entertainments Committee at Imperial College in West London who booked Jimi in May 1967. We booked a lot of great groups, like Steamhammer, Spooky Tooth, America – and Jimi Hendrix. It was a sort of ball: you had three or four groups playing in different parts of the building. We paid a thousand pounds for Jimi to come that night, and there were a thousand people in that hall. Tickets were more than a pound, so the Imperial College Union made a profit. This was before [May’s band]Smile. It was the days of my original band, 1984. We were playing in a room at the bottom, and Jimi was on in the main hall so, yes, in a sense, we supported him. I remember, we were stood in the little corridor backstage between the stage and Jimi’s dressing room – which was actually the jazz club room where Roger Taylor and I first played together, strangely enough. Just kind of clumped outside waiting for him. Jimi came out of the dressing room and said: ‘Where’s the stage, man?’ We just pointed [starstruck]. He was the coolest guy on earth. No doubt about it. We got fairly close to the front. But you didn’t have to be at the front, actually. It was all-enveloping. He started Foxy Lady, just widdling his finger on the string very, very, very slowly, building up a feedback note. He’d just smile and laugh and move it around. He was wicked. Always that twinkle in his eye. It took a long time – then suddenly he was ready, and he was at full volume, and he just rolled into that fantastic riff. My memory, really, is of being overwhelmed. It was slightly scary. I thought I could play guitar at that time. I thought I was okay on guitar. But when you saw Hendrix, you just really, really wanted to give up – or try a lot harder. I looked at his equipment, and looked at him, and thought: ‘Well, he’s just a man, and that’s just a guitar, and those are just amps.’ But when he started up it was like an earthquake. That doesn’t even describe it. It was like a cross between an earthquake, an orchestra and a whirlwind of sound. And it was apparently magical. But certainly, I can tell you, nobody was singing along. People didn’t sing along in those days. It just wasn’t done. It wasn’t cool, in a rock show, to sing along to Purple Haze. People had a lot more inhibitions, I think.